All product / features / functionality discussed is based on my personal interest. ... many other great bloggers are part of the BuySellAds virtualization network, making it very easy to advertize on multiple highly ranked virtualization blogs through one system. So it was rather nice surprise to notice yesterday that publisher SYBEX/A Wiley Brand is currently running an ad at TinkerTry, seen at right. Not just any ad, but the very same book. I can't think of a more appropriate ad to run here, and it's a nice gesture of support for content creators like myself. 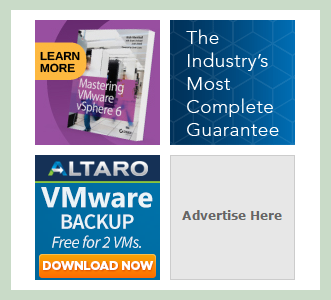 If you happened to be considering getting "Mastering VMware vSphere 6" as a holiday gift for your friends or yourself, please consider using this ad link as a way to show your support of TinkerTry, without any cost to you. New ad seen in purple, at top-left.